This article focus to Define and Discuss on Waves. Waves move because the surface of the water gains energy via winds that blow around it. Short waves tend to be produced by local stormy weather; long rolling swells are generally generated by large, distant storm systems approximately thousands of miles out. The energy with the waves then sorts the sand and moves it over the beach. 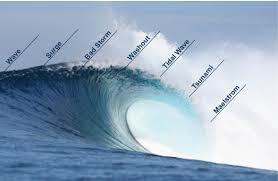 here briefly discuss on Wave height, Wavelength, Wave movement, waves of oscillation etc.